O God, who gave the Priest Saint Bernardine of Siena a great love for the holy Name of Jesus, grant through his merits and prayers, that we may ever be set aflame with the spirit of your love. Through our Lord Jesus Christ, your Son, who lives and reigns with you in the unity of the Holy Spirit, one God, for ever and ever. 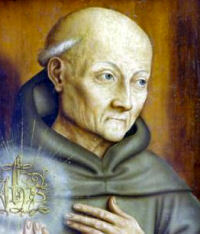 Born in 1380, St. Bernardine of Siena left the world at an early age in order to lead a hermit's life. When he was twenty-two, he entered the Franciscan Order, one of whose glories he is. Having been made General of the Order, he resigned this charge in order to devote himself to preaching. He preached the name of Jesus with such love that it wrought the transformation of many souls. He was instrumental in effecting many conversions. He died at Aquilea, in the midst of his missionary labors, on May 20, 1444, and was canonized six years later. This feast is celebrated today both in the Ordinary Form and Extraordinary Form of the Roman Rite. Bernardine was born in Carrara, Italy, in 1380. Even as a boy he nursed the sick during a time of pestilence in Siena. During a severe illness he decided upon entering a monastery and becoming a Franciscan. His superiors assigned him the task of preaching, and he submitted humbly despite a throat affliction. God heard his petition, and the ailment was miraculously cured. A powerful and eloquent preacher (Pius II called him "a second Paul") and a zealous apostle, Bernardine traveled the length and breadth of Italy, inculcating love and reverence toward the holy Name of Jesus. He exerted a powerful influence upon his contemporaries, inaugurating a genuine reformation within the Church. Seldom has a saint had so many and so distinguished followers (including St. John Capistran). Upon entering a city, Bernardine had a standard carried before him upon which was the holy Name of Jesus (IHS) encircled with twelve golden rays and surmounted by a cross. When he preached, this symbol was placed alongside the pulpit; or he would hold in his hand a tablet bearing the divine monogram in letters large enough to be visible to the entire audience. It was also his zealous appeals that induced many priests to put the Name of Jesus on the altars and walls of their churches, or to have little cards with the inscription distributed among the people. At his instigation the public buildings in many cities of Italy were adorned with the monogram suitably enlarged, as can still be seen in Siena. At the Council of Florence St. Bernardine labored strenuously to end the schism (1439). Often portrayed as: A Franciscan holding a sun upon which the Name of Jesus is inscribed. Our saint's glowing love for the holy Name of Jesus fills us with admiration. Keep this blessed Name on your lips, and more so in your heart. It is a Name that always arouses love for Christ. Never use it lightly or irreverently.